What's the proper way to sing this song? If our God is for and with us what can stand against us? How do we know that Jesus is who he said he is? Did Paul believe Jesus is God's son? Yes. He went to Athens and saw all the temples and statues. Including one for the unknown God. Paul preached to them about the unknown God. God is not a statue. He is too big. We have evidence that God is real in Jesus. He came back from the dead. Jesus rose so we would know he is God. Jesus is your friend. Jump and believe. We have been created for a divine purpose. No accident. Some have no idea why they are here. What i believe shapes me. Used to own Precision Camara Repair. Used to believe the harder i worked the more successful i'd be. Identities often get wrapped around the things we have. Colossians - what Gods do we have? As Christians Christ is in you. Christ! No more no less! Jesus is everything. We tell others about him. All of us have that task. Present Christ is to co-exist with others to bring them to faith. My agenda is often so fragmented. If Jesus is #1 then our priorities change to forgiveness grace love hope healing. Take on Jesus' nature. Build relationships around the Lord's Comunion table. As we share in the brokeness of Jesus we can help others. If I do what's right will things be better for me? Did it go well for Paul? He got beaten and jailed. They sang praise songs to God. Then there was an earthquake and all doors were open. The jailer and his family became Christians. Because they were faithful this family was saved for eternity. Elton DaSilva: Living Out Front: Purpose - living on the front porch. Too often we live in the fenced back yard. Have you ever felt like a pinball? Being bounced from place to place with light and noise. When you take God out of the Big Bang picture life has no purpose. Put God into creation and there is purpose. When we fail to read the instructions of the manufacturer we end up with holes in the wrong places. God has created us- his workmanship created for a person. A door knob is the key to opening doors. Be a doorknob. God who do you want me to connect to? to do the things God planned for you. When I lived in Brazil I wanted to be President of Brazil. 2. We need intentionality we think that if it feels good it must be from God. Even though things get tough keep going on the road God has called you to. intentionality Paul was called to go forward. Some of us are looking to much to our behinds or even worse to others' behinds. We need to look ahead to what God wants us to do and do it. When Paul was preaching this young lady kept saying here are servants of God. Paul got tired of her distraction from the message. He kicked out the evil spirit and he got arrested. Goliath was insulting the God of Israel. When David asked about it his brother said why are you sticking your nose into this? What is distracting you from the cause God called you to? Connect to the manufacturer and follow the cause He has called you to. Pray for Jaqui Bergen and her family. Her dad passed away suddenly on Saturday. Pray for Audrey Voth and others fighting cancer. Faith is believing something you can't see. Who are the bad guys? Saul persecuted Christians. He busted into Christians' homes and dragged them off to jail until God interrupted him. Blinded him. Then Ananias had a vision to help Saul regain his sight. He did what God asked him to do. Now Saul's gang decided to kill Saul. The Christians helped him escape. But the Jerusalem Christians did not trust Saul, until Barnabas stood up for him. S(P)aul knew that he had done terrible things. The Christians forgave him. Paul could see God thru them. Summer theme. Saul who is Paul. Live Life in plain view on the front porch. Are you sitting there with Lemonade or shotgun? Do you have REAL friends? Do things stand between you and real relationships? Facebook? We respond more to text messages than other media. Simple Message about what God wants in our relationships. We look at each others' faces. Our primary tool of communication. Your Name is so significant. He knows my name. Greet each other by name. He knows my face. He wants to meet us face to face. Today we see God as in an old mirror. In eternity we will see Him clearly face to face. Moses' people said you talk to God and tell us what God says. But God wants a face-to-face relationship. We need to meet God face to face. Paul talks about the people in his life by Name. See the last verses of his letters. Paul says truthing in love helps us grow in Christ. More than speaking. Embodying truth in life. 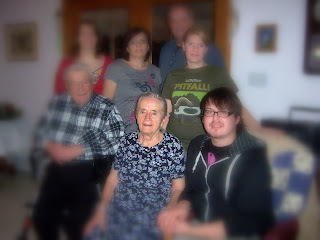 Elizabeth Dueck (nee Plett) was born on April 20 1924 to Cornelius R. and Maria K. Plett of Blumenort, Manitoba. Elizabeth was the third child in a family of 10 children and was the second of 2 girls born. From an early age it was clear that Elizabeth was an intelligent girl. Attending the one room school in Greenland until grade eight, she showed particular interest in grammar, spelling, and reading. One of her favorite books was Uncle Tom’s Cabin by Harriet Beecher Stowe. This love of reading continued throughout her life. Even when unable to read in her old age, she listened avidly to books on tape or the stories read to her by her children and grandchildren. Although the school teacher visited Elizabeth’s parents to request that they allow her to continue school past grade eight, duties around the house and farm took priority. Elizabeth’s main responsibilities included feeding chickens, sweeping, washing the floor, painting, and mending her brother’s clothes. In the summer, Elizabeth worked in the garden hoeing, picking gooseberries and cherries, as well as digging up potatoes and carrots. Elizabeth was always a dreamer. Elizabeth said that during her youth, “I was dreaming of someday being important” and “when I read the story of Joan of Ark I thought maybe I could also be a good leader”. It was these dreams which led her to pursue nurse’s training in Winnipeg at the age of twenty-two. Elizabeth’s parents were wary of her decision as it meant she would have to live in an apartment in the city and quite far away from home. Even with her parent’s concerns, Elizabeth enrolled in the Licensed Practical Nursing program at St. Joseph’s Hospital (now Misericordia Hospital). She enjoyed the program and did well in her studies. Upon her graduation in 1947, Elizabeth received the General Proficiency Award for excellence in her academic studies as well as practical work. Elizabeth’s lifelong marriage and friendship with Willie Dueck began one day when the Plett family was invited to the home of Willie’s family. Willie recalls that “the first time I saw her, I loved her”. A short time later, they met again at a family wedding after which Willie gave her a ride home. Elizabeth remembers that she thought Willie must have made a mistake and could hardly believe that he was coming to visit her. After this momentous first ride together, Willie and Elizabeth continued to visit each other about once a month. The frequency of their visits increased over the course of their relationship until they saw each other about once every two weeks. The decision to get married was marked with uncertainty for some time. Elizabeth was unsure whether it was time or not for marriage. She also knew that marrying Willie meant that a move to Mexico would be made immediately. Elizabeth stated that when she decided to marry Willie, she was ready to “face the adventure together”. Their wedding on November 21, 1948 was followed by honeymoon which was an adventure that would take them through Western Canada and the United States to Mexico where they would settle along with Willie’s family. Shortly after arriving in Mexico, a medical clinic began in Willie and Elizabeth’s home. It all started when Elizabeth began giving medical treatment to a man on the colony who had had a stroke. Elizabeth went into the city to speak to a doctor about what should be done and was told to give intravenous medicine to the man even though she had not been trained as a LPN to do this procedure. As Elizabeth was fond of saying, “necessity is the mother of invention”. Elizabeth continued to perform procedures and give treatments of all kinds, and within only a few months an informal clinic began in the family’s garage. Elizabeth treated all sorts of ailments and sicknesses including infections, cuts, fevers, and coughs. She also delivered countless babies and together with Willie kept a store of medical supplies which acted as the local pharmacy. Although the clinic primarily served the Mennonites in the area, Mexican people were also frequently treated and in many cases, Elizabeth made house calls to Mexicans, becoming confident in speaking Spanish. When Elizabeth was not seeing patients, she frequently received phone calls from people in the community with health related questions. With all of the time spent providing health services, life was very busy and sacrifices sometimes had to be made where other household tasks were put aside. This clinic set the foundation for medical services in the community and grew overtime so that it is now a medical hospital, continuing to serve the community. In 1964 Willie and Elizabeth sold almost all of their processions in a large auction in Mexico and moved with their children to the Arborg area in Manitoba’s Interlake. Life again was very busy. Elizabeth reflected that there was no time for relaxation as there were “too many busy things to do and too many children wanting something here and there and everywhere”. Elizabeth was responsible for cooking, cleaning, washing, gardening, and caring for her children. She also worked side by side with Willie on the various businesses they started. First on the farm, then Vidir Lumber, and later Vidir Machine. The employees of each business became part her extended family. Elizabeth’s personal faith in God was an important part of the way that she treated patients and was evident in the way she lived her life. A nighttime prayer for each of her children and grandchildren was part of her daily practice. She was also a generous and hospitable host for family, friends, and anyone who happened to come by the house. She was always available to those in the community who needed medical advice. Along with her deep appreciation for nature, birds, flowers, and singing, Elizabeth taught many of us to take notice and celebrate the beauty present all around us. She had a way of making each person who she was with, feel special, valued, and loved. Elizabeth had a keen sense of adventure and loved to travel. She tried water tubing for the first time at age 70, and was never afraid to try something new. She was also a woman who loved to give. She loved deeply and till the very end she would often try to say the words “I Love you”, even when too tired for anything else. She gave of her time, and her home was often full. She delighted in giving candy to grandchildren and any other children that walked through her door. She wanted to make sure that every visitor would leave with some small gift. For the last five years of her life, Elizabeth struggled with Dementia. Although this presented many challenges for her and those who cared for her, we also continued to appreciate Elizabeth’s boundless love and affection given through frequent kisses, tickles, and ‘I love you’s’. She also never failed to surprise us and make us laugh with her rye jokes and keen observations. The legacy of Elizabeth’s love, faith, compassion, and intelligence will continue to inspire and move all of us, those family and friends who were privileged to have her as a part of our lives. Children: Raymond (Martha), Neil (Mary Ann), Rose, Trudy (Peter Dueck), Bernie (Caroline), Mary (Henry Friesen), Calvin (Anna), Sid (Bea),and Gloria. Elizabeth is predeceased by one daughter, Mary Anne in infancy, grandchildren, Kristin, Jason and Renee. The family would like to thank Leona , Bertha and Doris and Clara for the wonderful care Mom received during her last years. They were truly God’s gifts to us. We would also like to thank Jodine Sigvaldason for walking with us through those final days and moments. We are deeply thankful for doctors, home Care, and people in the community who have gone beyond the call of duty to support us in this journey. And we thank our sister, Rose for the incredible way that she has given of herself to be there for mom. We also thank Gloria for making it a priority to support Dad and Rose, and to be there with Mom, especially during the last weeks of her life. God has assigned specific roles last week was about fathers. The passage from eph 5:21-24 is one of the most abused pAssages in the Bible. People read the part about wives submit but they forget that it starts with submit to one another. The husband should sacrifice himself for his wife like Christ did for the church. All Activities should be evaluated  _ is it In line w god's word? Is God speaking to me to my heart? Manipulation of other is Wrong. Confront ungodly demands. God wants an orderly arrangement in the family. Look for input and shared decision making to govern the house. There are many intelligent and successful women in our midst. They take care of things. At age 18 as a new Christian David was approached by the Dean of Women to help start a new church. She felt God calling her to do this. She knew exactly what to do. That. Burch is now a bi church. 3. She is full of wisdom. The woman who fears the Lord is to be praised. That dedication is a covering for the house. Prov 8:13 she gives faithful instruction. See the story of Deborah. She was a prophet judge and leader. She told the military leader what to do. Get 10,000 men together and God will deliver. In the story of Nabal (the fool) David was going to destroy all the men in Nabal's employ but his wife Abigail quickly intervened to keep David from murder. She was wise. They have 18 events on the calendar, 41 birthdays, and 7 anniversaries this week. Forever I am changed by your love. Had a Moment of clarity. Stop accusing and listen. God is sovereign. Trust that God is who He says he is. Even if we haven't got it all figured out. Here I stand I found the greatest love the greatest sacrifice. Testimonies of people from Iran, Congo how they were persecuted. We are so blessed to live in America where we can argue about CNN vs. Fox News. Do we take that for granted? Why do people say that? Do the activities get too heavy? John Adams wrote that July 4 should be celebrated in churches and Communities from sea to sea. In a few days Americans will be celebrating 236 years. Blessed by God in a way others only wished. 1. For the glory of God Columbus came to San Salvador (holy savior) he planted a cross. the Mayflower Compact for the advancement of the Christian faith. 3. Government Patterned after Biblical Principles. 15,000 writings by the founding fathers. Primary source the Bible. 34% directly from the Bible. 3 branches of government. Not from history Plato etc. Of the 54 framers were 52 were born again Christians. England sent their prisoners to america and eventually only 17% of the people went to church. The Jonathan Edwards started the great Awakening. That lead to the American Revolution. Most people don't know what it is anymore. Can you imagine a teacher reminding the students to remember that In God We Trust? The U.S. Passport is a powerful document. 2. Proclaim the truth - we still have freedom of expression. Christianity is not the law of the land but shapes public policy. By free Conviction. Stand up and lead people to Christ and that will change their thinking. 3. Participate. Elect. Many people have died for our priviledge to mark the ballot. It is wrong not to participate. As Christians - don't vote Republican or Democrat - vote Biblically. Vote for people who best express biblical values and strong morals. Make sure they have character. Hope is a Christ centered church.